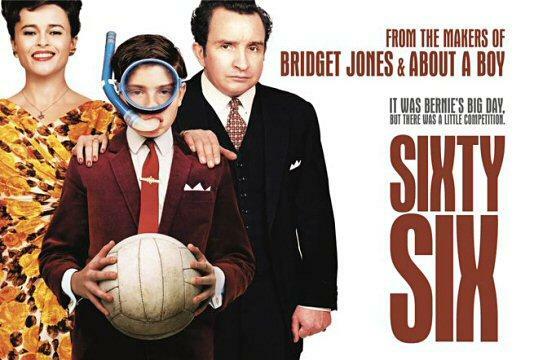 Inspired by director Paul Weiland's childhood, notably a fraught bar mitzvah that coincided with the 1966 World Cup final, the British comedy "Sixty Six" recalls Neil Simon, but the good Neil Simon -- the one who delivered commercial mainstream comedy with just enough honest sentiment to make it stick, as in "Brighton Beach Memoirs." The film concerns the Rubens family of North London. Father Manny and his brother, Jimmy, are grocers about to be walloped by the supermarket opening just up the street. Mother Esther has her hands full with her wild hare of an older boy, Alvie. This leaves our young protagonist, Bernie, who is pinning everything on what he hopes will be "the 'Gone With the Wind,' the Cassius Clay of bar mitzvahs." But if England makes the soccer finals, everything'll be ruined, no one will show up, and life will be destroyed. It's labeled a "true-ish story," and the results are cheeky fun. Whatever the period, whatever the religion, even the most casual filmgoer will recognize the coming-of-age territory. The script by Peter Straughan and Bridget O'Connor is longer on neatness than comic invention, but the acting is so good you don't notice what's not there until you're back on the street. Gregg Sulkin makes for a highly sympathetic (as well as asthmatic) young Bernie, and Helena Bonham Carter is spot-on as Esther -- tart, forthright, a little worn around the edges. Everything she does relates to her Job-like husband, played by the superb Eddie Marsan. He's the one you remember. While I wish the writers and director Weiland had played Manny's obsessive-compulsive disorder for something more than surface laughs, Marsan's stoic acceptance of all bad things coming his way, coupled with that look in his wary eye that says, "Worse things are coming," adds up to a performance that feels fully formed and fully alive, even at its most deadpan. Marsan is equally strong in Mike Leigh's new picture, "Happy-Go-Lucky," in which he plays a paranoid, rageful driving instructor. It's a role (and a film) destined to attract more admiration than "Sixty Six." But I like this movie, and even the mega-happy ending -- a bit of a stretch given the level of adversity endured by Bernie en route -- works, thanks to its excellent ensemble. Directed by Paul Weiland; written by Peter Straughan and Bridget O'Connor; photographed by Daniel Landin; edited by Paul Tothill; production design by Michael Howells; music by Joby Talbot; produced by Tim Bevan, Eric Fellner and Elizabeth Karlsen. A First Independent Pictures release. It was Bernie's big day. But there was a little competition. It is the summer of 1966, and England is about to be consumed by World Cup Fever. For 12-year-old Bernie Reuben (Gregg Sulkin) though, the biggest day of his life is looming: his Bar Mitzvah, and the day he becomes a man. However, Bernie's family are increasingly distracted by the threat of losing their business and their wayward older son, and the scale of Bernie's Bar Mitzvah diminishes daily. Worst of all the Cup Final is scheduled to take place on the same day and when England makes it through the qualifying rounds, Bernie's longed-for Bar Mitzvah looks set to be a complete disaster. Based on the real-life experience of director Paul Weiland, SIXTY-SIX is a coming-of-age comedy starring Eddie Marsan (Mission Impossible III, Vera Drake), Helena Bonham Carter (Charlie & The Chocolate Factory, Big Fish), Stephen Rea (V for Vendetta, Breakfast on Pluto), Catherine Tate, Peter Serafinowicz (Shaun Of The Dead), Geraldine Somerville, Richard Katz, Ben Newton and Gregg Sulkin. 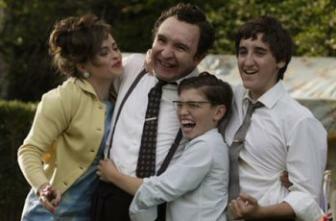 Eddie Marsan (Manny) is fast becoming one of our most in-demand actors. He recently completed filming Michael Mann's feature film version of his hit TV series Miami Vice, the JJ Abrams-helmed Mission Impossible III, starring Tom Cruise, James McTeigue's action-drama V for Vendetta, with Natalie Portman and Hugo Weaving, and Neil Burger's period drama The Illusionist, with Edward Norton and Paul Giamatti. He is currently filming The Restraint of Beasts for director Pawel Pawlikowski, with Rhys Ifans and Ben Whishaw and I Want Candy with Mackenzie Crook for director Stephen Surjik. It was Eddie's moving performance as the immensely likable Reg in Mike Leigh's critically acclaimed abortion drama Vera Drake which got him noticed, also winning him the Best Supporting Actor Award at the British Independent Film Awards 2004. Eddie went on to film The New World for director Terrence Malick, The Secret Life of Words for Isabel Coixet, with Tim Robbins and Sarah Polley and Sturla Gunnarson's Beowulf & Grendel. He also starred alongside Timothy Spall in Adrian Shergold's critically acclaimed drama about Britain's last hangman, Pierrepoint. Born and bred in Bethnal Green, Eddie served an apprenticeship as a printer before becoming an actor. His earlier feature film credits include Jon Amiel's Watch That Man, Michael Radford's B Monkey, David Kane's This Year's Love, Sara Sugarman's Mad Cows, and Paul McGuigan's Gangster No 1. More recently Eddie worked on Martin Scorsese's Gangs of New York, David Thewlis' Cheeky, and Alejandro Gonzalez I��rritu's 21 Grams. Eddie has also worked extensively in television. Most recently, Stephen Poliakoff's Friends and Crocodiles, in which he plays an eccentric academic. Other television credits include Quite Ugly One Morning, The Baader Meinhof Gang Show, Joe Wright's Charles II and Bodily Harm, Pull Out More Fags, The Vice and episodes of Kavanagh, Game On, Casualty, Grange Hill, Eastenders, and The Bill. Eddie has also appeared on the London stage in productions of Antarctica, A Place at the Table, Richard III, Chips with Everything, The Homecoming, and Serving It Up. Helena Bonham Carter (Esther) is an actress of great versatility, and one of the UK's finest and most successful. Most recently, she has starred in Conversations with Other Women opposite Aaron Eckhart, as Mrs Bucket in Tim Burton's massive hit Charlie and the Chocolate Factory, and provided the voices for the aristocratic Lady Campanula Tottington in Wallace & Gromit - Curse of the Were-Rabbit, and the eponymous dead heroine in Tim Burton's spooky Corpse Bride. Her acclaimed performance in Merchant Ivory's The Wings of the Dove in 1997 won her a Best Actress Academy Award nomination, a Golden Globe Best Actress nomination, a BAFTA Best Actress nomination, and a SAG Awards Best Actress nomination. It also won her a Best Actress Award from the National Board of Review, the Los Angeles Film Critics, the Boston Society Film Critics, the Broadcast Film Critics Association, the Texas Society of Film Critics, and the South-eastern Film Critics Association. Other notable credits which followed include her appearance with Steve Martin in Novocaine, her memorable performance as Marla Singer in David Fincher's neo-classic Fight Club opposite Edward Norton and Brad Pitt, Tim Burton's remake of Planet of the Apes, in which she played an ape, Thaddeus O'Sullivan's The Heart of Me, opposite Paul Bettany, and Big Fish, her second effort with Tim Burton in which she appeared as a witch. Helena achieved success in films early on in her career. Before she was 20 years old, she had scored her first lead in director James Ivory's tasteful adaptation of EM. Forster's novel A Room With a View (1985), only her second film after playing the leading role in Trevor Nunn's Lady Jane. Helena went on to make three more films under the Merchant-Ivory banner - Where Angels Fear to Tread (1991) and Howard's End (1992) - and an earlier uncredited appearance in Maurice (1987). Helena has also starred in Mick Jackson's Live From Baghdad, alongside Michael Keaton, receiving a nomination for both an Emmy and a Golden Globe; Paul Greengrass' The Theory of Flight, in which she played a victim of motor neurone disease; Trevor Nunn's Twelfth Night, in which she played Olivia, opposite Woody Allen in his Mighty Aphrodite, Mort Ransen's Margaret's Museum, Kenneth Branagh's Frankenstein, and Franco Zeffirelli's Hamlet. In between her many films Helena has also managed a few television appearances which include most recently her portrayal of Jacqui Jackson in Magnificent Seven, the tale of a mother struggling to raise seven children - three daughters and four autistic boys; as Anne Boleyn in the two-part biopic of Henry VIII starring Ray Winstone; and as Morgan Le Fey alongside Sam Neill and Miranda Richardson in Merlin. Earlier television appearances include Michael Mann's Miami Vice as Don Johnson's junkie fianc�e, and as a stripper who wins Rik Mayall's heart in Dancing Queen. Helena has also appeared on stage in productions of Trelawney of the Wells, The Barber of Seville, House of Bernarda Alba, The Chalk Garden, and Woman in White. Stephen Rea (Dr Barrie) has a long and distinguished acting career in film, television and theatre. He is one of Ireland's most talented and versatile actors. Most recently he has been seen playing opposite Natalie Portman and Hugo Weaving in James McTeigue's actioner V for Vendetta, Gillies McKinnon's Tara Road with Andie MacDowell, Neil Jordan's Breakfast on Pluto, with Cillian Murphy and Liam Neeson, and Vincent Ward's The River Queen, opposite Samantha Morton and Kiefer Sutherland. Other recent credits include Damien Harris' The Good Shepherd, Tim Hunter's Control, Lance Daly's The Halo Effect, Sean Walsh's Ulysses, Roland Suso Richter's The I Inside, Bruce Beresford's Evelyn, William Malone's FearDotCom, and Peter Hyams' The Musketeer. Best known for his Academy Award nominated performance as the reluctant IRA volunteer in Neil Jordan's The Crying Game in 1992, he made his film debut in Jordan's Angel in 1982 as a saxophone player who gets involved in gangland violence. Other films with Jordan include End of the Affair, In Dreams, The Butcher Boy, Michael Collins, Interview With A Vampire, and Company of Wolves. He also appeared Mike Leigh's Life is Sweet, Les Blair's Bad Behaviour, Michael Austin's Princess Caraboo, Robert Altman's Pr�t A Porter, David Evans' Fever Pitch, and Brian Gibson's Still Crazy. Stephen's film roles are only part of his prestigious acting career. He is also a great stage actor who has appeared in many different and distinguished theatre productions, entertaining audiences in Ireland, London and Broadway. He won a Tony Award nomination for Best Actor on Broadway for the critically acclaimed production of Someone Who'll Watch Over Me, and recently returned to London's National Theatre in Cyrano de Bergerac. Stephen is also a founding member of Ireland's groundbreaking Field Day Theatre Company. He has also worked extensively in television where his credits include Howard Davies' Copenhagen and Armadillo, Danny Boyle's Scout, Mike Leigh's Four Days in July, Michael Lindsay Hogg's The Seagull and Professional Foul, Stephen Frears' Early Struggles, Peter Gill's Fugitive, and Ken Loach's Days of Hope. Catherine Tate (Aunty Lila) is fast becoming one of the most sought after actresses working today. As a leading actress, Catherine has an array of credits -and in the last year alone, has co-starred in the West End theatre production of Neil LaBute's Some Girls, alongside David Schwimmer - and in the feature films: Love & Other Disasters (alongside Brittany Murphy), Scenes of a Sexual Nature, (with Ewan McGregor), and Starter for Ten; in addition to two further series and a Christmas special of her award-winning BBC TV series: The Catherine Tate Show . The series won the Best Comedy award at the 2004 Banff Film and Television Awards; with further nominations in the Best Show and Best Actress categories at the Monte Carlo Film and TV Awards. Catherine won Best Television Newcomer at the 2004/05 British Comedy Awards and Best Comedy and Best Comedy Performer, at the 2005/6 RTS awards. Catherine was also nominated for a 2005 International Emmy for Best Performance by an Actress; and for Best Actress and Best TV Comedy at the 2005 British Comedy Awards. Autumn 2006 sees the broadcast of third series of The Catherine Tate Show - and Catherine will star in the feature film - Mrs Ratcliffe's Revolution, and in the ITV drama The Bad Mother's Handbook. Catherine previously co-starred in the sitcom, Wild West (two series for BBC1) as the series regular, Angela (alongside Dawn French), and as one of the leads in the second series of the BBC Award winning sketch series Big Train. Peter Serafinowicz (Uncle Jimmy) started his career in Liverpool on radio, but soon realised his talent for mimicry and impressions, and has carved a career out of his various voices to become one of the UK's top voice over artists. His acting career is following close behind with guest roles in the popular sitcoms Spaced, Hippies, and Black Books. He has recently written, produced and starred in the series Look Around You, which was nominated for a BAFTA and was released on DVD in October. The second series of Look Around You has recently aired on the BBC. His feature film credits include Roger Spottiswoode's White on White, Edgar Wright's Shaun of the Dead, Alex de Rakoff's The Calcium Kid, and he provided the voices for the Shrunken Heads in Harry Potter and the Prisoner of Azkaban, and Darth Maul in Star Wars - The Phantom Menace. Other television credits include Hardware, I'm Alan Partridge, Ted and Alice, The Magical Legend of the Leprechauns, Smack The Pony, and Comedy Nation. Geraldine Somerville (Alice Barry) trained at the Guildhall School of Music and Drama. She did some stage work and appeared on TV in episodes of Poirot and Casualty before landing the role of Penhaligon or Panhandle, in Cracker with Robbie Coltrane for which she received a BAFTA Best Actress nomination. Since then she has gone on to appear in feature films including Haunted, Jilting Joe and Gosford Park but is probably best known for the role of Lily Potter in the Harry Potter films. Her other television credits include The Aristocrats, The Safe House, Murder in Mind and Jericho. Richard Katz (Rabbi Linov) has recently appeared in Way To Heaven at the Royal Court, Faustus at Northampton directed by Rupert Goold, Measure For Measure at the National Theatre, and The Hanging Man for Improbable Theatre/West Yorkshire Playhouse. His recent film and TV credits include Hustle for Kudos/BBC, Absolute Power and Hyperdrive for the BBC, Enigma directed by Michael Apted, and Rome for HBO directed by Julian Farino. Gregg Sulkin (Bernie) makes his screen debut in SIXTY-SIX. He is thirteen years old and lives with his family in London. Gregg is an excellent all round sportsman, he is outstanding at tennis and has played football professionally for five years at Queens Park Rangers and West Ham United.